Almost 300 people were missing Wednesday morning after a South Korean ferry sank off the southern coast of the peninsula. The vessel was carrying 459 people, most of them high school students on an overnight trip to a tourist island. So far 164 people have been rescued, and the bodies of at least four people — one female and three males — have been confirmed dead. The ferry "Sewol" left from the port of Incheon in the northwest of South Korea late Tuesday night, on its way to Jeju, a southern resort island. Around 9 a.m. local time on Wednesday the vessel sent a distress signal, according to the coast guard, which triggered a major rescue operation. Almost 100 coast guard and navy vessels and fishing boats, and 18 helicopters were involved. The U.S. Seventh Fleet said the USS Bonhomme Richard was at the scene to help with the rescue effort, and that it was ready to offer more assistance. The cause of the disaster is still not clear. Rescued passengers described feeling the boat tilt over to one side before hearing a loud bang from inside the ship, which has led some to speculate that the ship may have impacted with something. 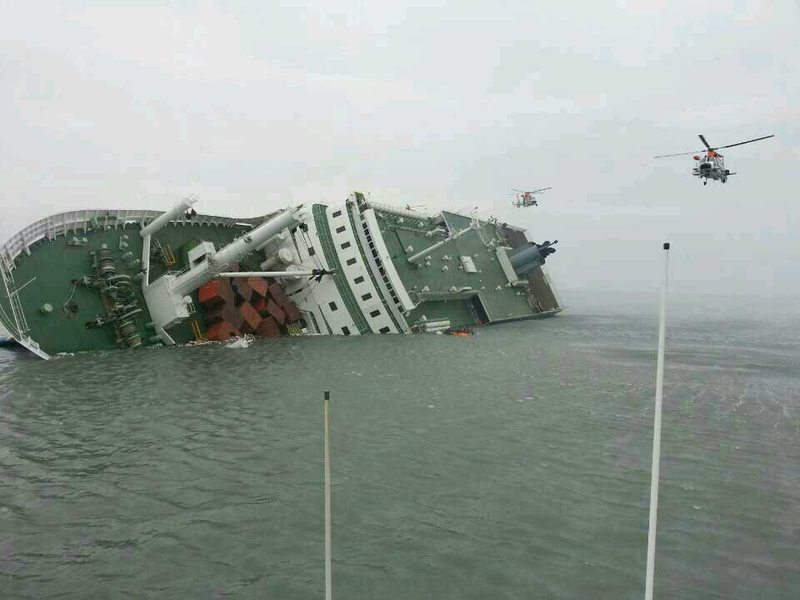 Within the space of a couple of hours the Sewol was lying on its port side, with water gushing in. Some passengers were winched to safety by helicopters; others put on life-jackets and flung themselves into the chilly waters, frantically swimming toward the lifeboats. Not long after, the ferry had turned over completely, and only the forward section of its blue and white hull was showing above the waterline. One survivor told the YTN news channel that once the boat began to tilt an announcement was made asking passengers not to move as it might be dangerous. People began to move onto the upper levels once the water started gushing in, but the passenger reported seeing as many as 30 people still trapped inside the ship before he was rescued by helicopter. Navy divers began searching the scene in an attempt to find those unaccounted for, but their efforts have been severely hampered by poor visibility caused by mud in the sea water. The high school students are from Ansan Danwon High School in Ansan, just south of Seoul. At the school, parents gathered to hear news and students were sent home. Initially parents were mistakenly told that all of the 325 students had been rescued, but this was later found not to be the case. So far 78 students have been safely rescued. The 6,325-ton ferry was built in Japan in 1994 and owned and operated by the privately-held Chonghaejin Marine Co. According to a company official a Chonghaejin ferry named "Democracy No.5" collided with a fishing boat near Incheon late last month with no casualties.